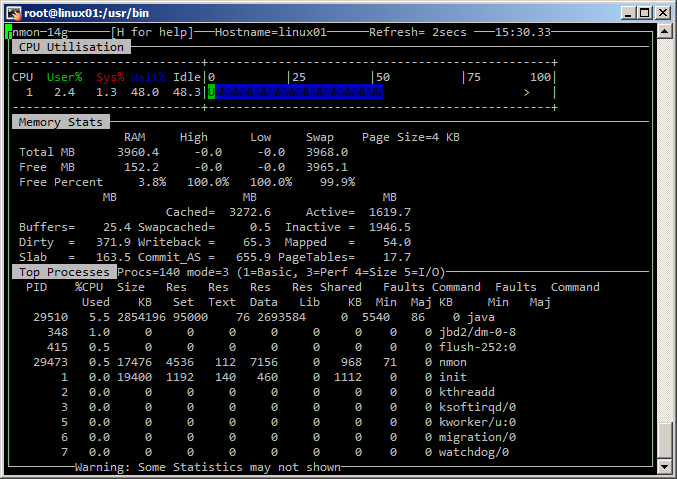 The nmon (Nigel’s Monitor) tool was written initially for AIX to monitor system performance, but there are plenty of distributions available now so people can use it on a variety of operating systems these days, including flavours of Linux and even the recent Raspberry Pi (mini ARM based computer). It’s one of my favourite performance monitoring tools out there, and can be used to obtain information on CPU, memory, network, disk I/O, top processes etc. As well as running nmon interactively, you can also run it in recording mode to build up historical statistics for your server(s). There is a good article on the IBM developerWorks site here (focusing on the AIX versions) which also explains how to run nmon in recording mode and gather historical snapshots.